14 day Highlights of Morocco tour including return international flights, airport transfers, breakfast daily, escorted tour guide throughout, dedicated, air-conditioned transportation, in-depth sightseeing and more. I would like to say that my travel experience with Webjet Exclusives has been an extremely satisfactory one and has made me want to use this service again. It was easy to book and organise, I will definitely book again though Webjet eExclusives and recommend them to anyone considering booking a holiday. Morocco is more than just a desert gateway to magical Africa. 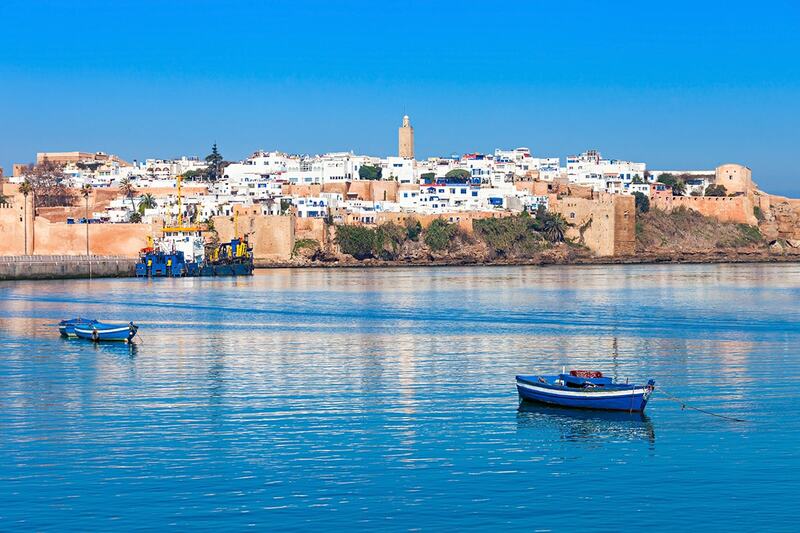 Morocco is full of mesmerising landscapes, rugged coastlines and charming cities. It is abundant with marvellous sights and fulfilling activities and boasts delightful local cuisine, warm hospitality and a rich history. 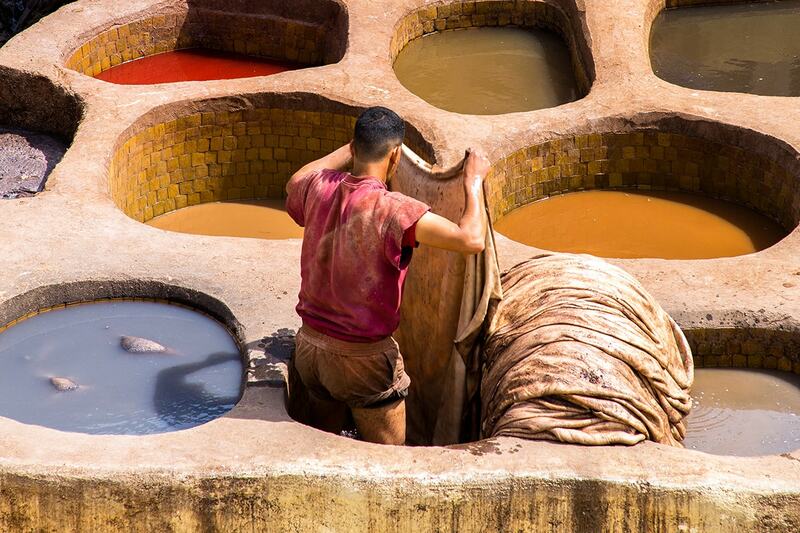 Experience the unforgettable colours and culture for yourself with a 14 day Morocco tour. Explore the allure of Meknes’ medina, the old walled section of the city, discover the ruins of World Heritage Site, Volubilis, wander the spiritual and cultural heart of Morocco in Fes and see the Saharan village of ancient Merzouga. Enjoy a home cooked-dinner with a local family and travel towards the Atlantic Coast and the old fishing town of Essaouira. 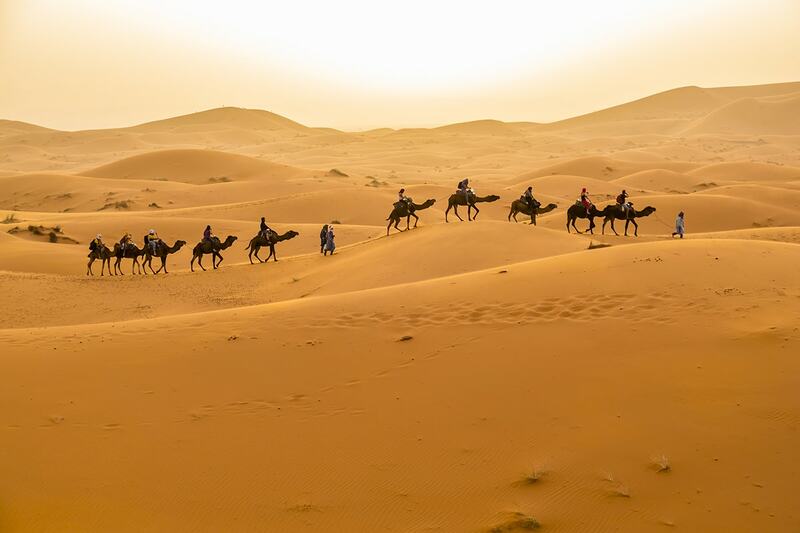 Ride a camel across the desert at sunrise, set off on the fables ‘Road of 1,000 Kasbahs’, embrace the vibrance of renowned Marrakech while enjoying an escorted foodie tour and so much more on this once-in-a-lifetime journey. 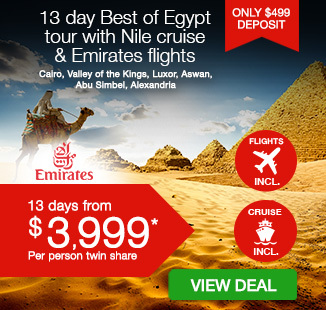 Your package includes return international flights, accommodation, breakfast daily, professional tour guides, in-depth sightseeing, dedicated, air-conditioned transportation and more. Depart Australia today to begin your incredible adventure to Morocco! Welcome to Morocco. On arrival you will be met and transferred to your hotel. The remainder of the day is free to explore the city, but an important welcome meeting will be held at 6pm this evening. Please check the hotel reception for details. 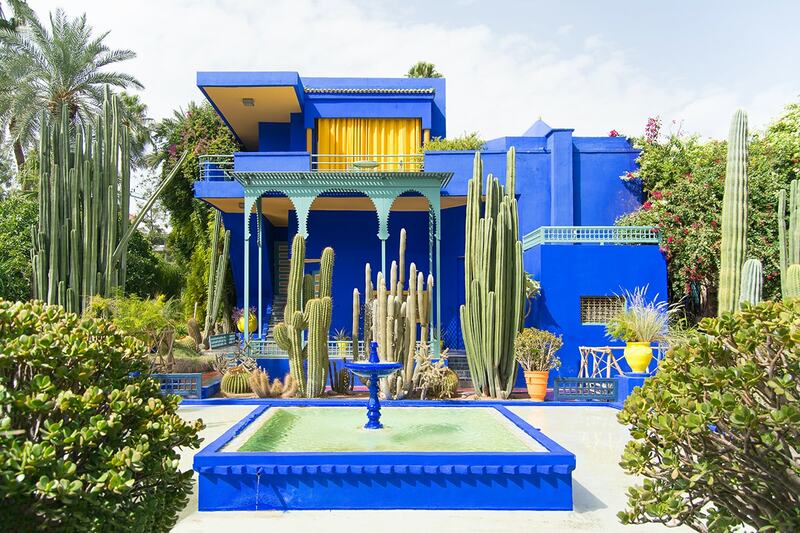 If you arrive with time to spare, then a great option for your limited time in Casablanca is to visit the art deco Villa des Arts. This gorgeous gallery dates to the 1930s and holds numerous exhibitions of contemporary Moroccan and international art. If you are looking for a different type of cultural experience, then you can discover a unique and fascinating part of Moroccan history at the Museum of Judaism. After breakfast today, drive to the capital of Rabat. Rabat’s history is long and colourful, having been host to Roman settlements, pirates and more recently the Moroccan parliament. It contains numerous fine Arab monuments, some dating from the 10th to 15th century Almohad and Merenid dynasties, and others that are far older. The earliest known settlement is Sala, occupying an area now known as the Chellah, where you will visit the remains of the citadel. You will also see the vast minaret of the Hassan Mosque and explore the lovely walled quarter known as the Kasbah des Oudaias. In the late afternoon, continue to Meknes (approximately 2 hours), the sixth largest city in the kingdom, and former capital of Morocco. This morning you will discover the charming streets of Meknes’ medina – the old walled section of the city. 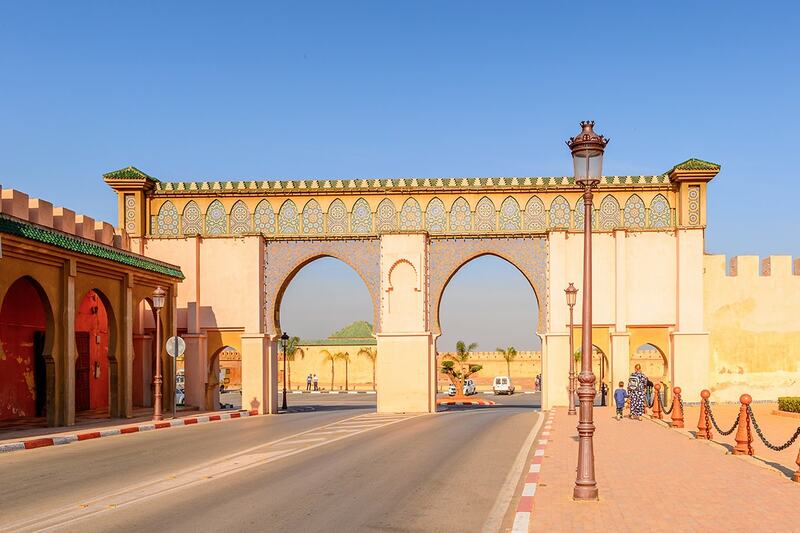 Enter via the northern gate, Bab Berdaine, and walk to the shrine of Moulay Ismail who, in the 17th century, turned Meknes from a provincial town to a spectacular Imperial city. You will explore the elaborately decorated public buildings hidden in these winding streets, including the lovely Bou Inania Medresse (religious school). Take some time to soak up the bustling atmosphere of the old souk before driving out of the city to the ruins of Volubilis (approximately 45 minutes). Volubilis was once a provincial Roman capital, a distant outpost of the empire, and the remains make an undeniably impressive sight. 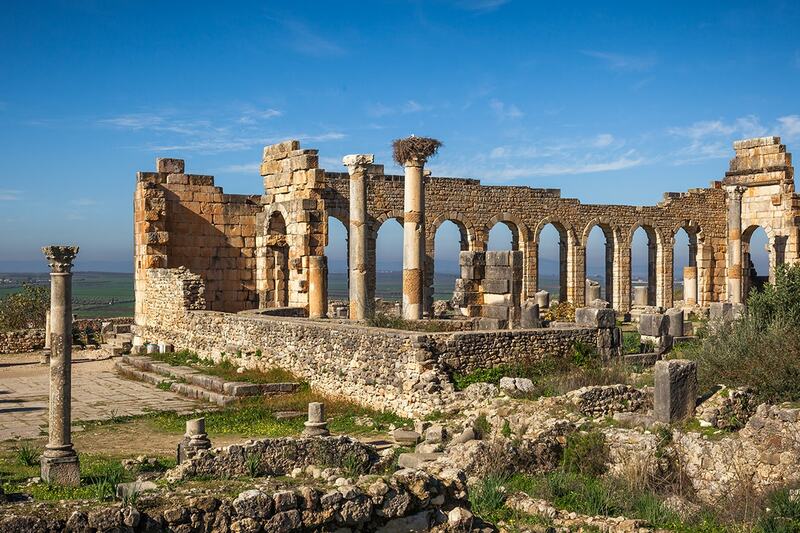 Volubilis is the foremost Roman site in Morocco and was declared a World Heritage Site in 1997. Upon arrival you will take a tour around the ruins with a local guide. Please remember to pack drinking water, hat, sunglasses and sun cream for this tour as it may get hot and you will be exposed to the sun. And, of course, don’t forget to take your camera as the town is filled with fantastic mosaics along the Decumanus Maximus, many of which remain intact. After time spent imagining Volubulis as the bustling city it once was, continue to the living museum of Fes for the night (approximately 1.5 hours). Tonight, experience local culture up close as you enjoy a home cooked-dinner with a local family. Pastilla is a specialty dish in Fes and easily ranks among the most popular meals cooked at home. A true delight for your senses off the beaten path! Fes is the spiritual and cultural heart of Morocco; vibrant, noisy, fascinating and overwhelming – a visual and pungent feast for the senses. It is made up of three distinct ‘cities’, or quarters, and you will stay in elegant, riad-style accommodation on the edge of the huge, well-preserved medieval old city – the mother of all medinas. Today head into the old city, known locally as Fes el Bali, arguably the world’s most fascinating and confounding old city. Medieval Fes was one of the world’s great centres of education and culture, both Islamic and Jewish. Its religious institutions and libraries are legendary, its mosques of great renown. Walk through the twisting streets and alleyways, passing donkeys piled high with goods, and explore the specialty sections that divide the souk. Filled with historic khans, medresses and dye-pits, stalls loaded with fruits, herbs and soups, and where the squawk of chickens, smell of spice and sound of hammering of copper fills the air, it’s not hard to imagine yourself back in the Middle Ages. Spend the day exploring the old city, visiting, Mederassa Bou Inania, the tanneries and the splendid Funduk Nejjarine, a beautifully restored 18th century inn. Return to your hotel in the late afternoon and enjoy a memorable dinner of one of the city’s signature dishes, the salty and sweet pastille. 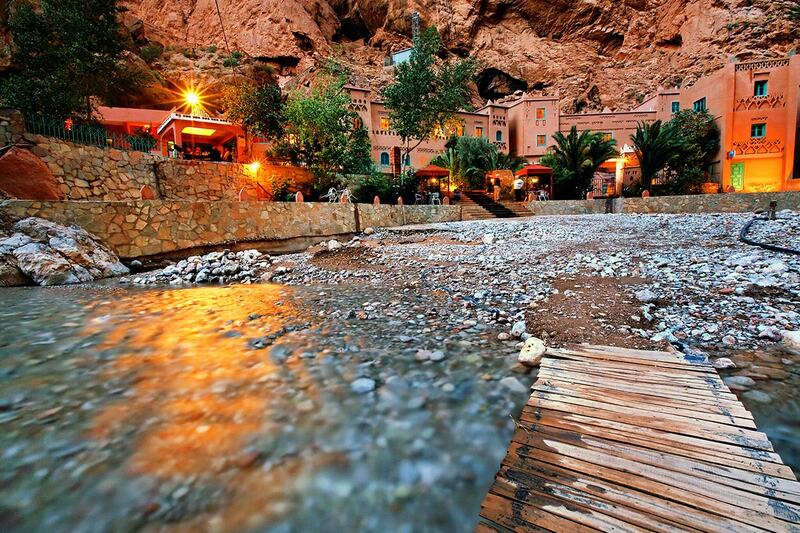 Today, leave the intensity of the city behind for the simplicity of the High Atlas Mountains. Drive south, inland through a variety of spectacular scenery – fertile valleys, cedar and pine forests and barren, rocky landscapes – to the small town of Midelt (approximately 4 hours). 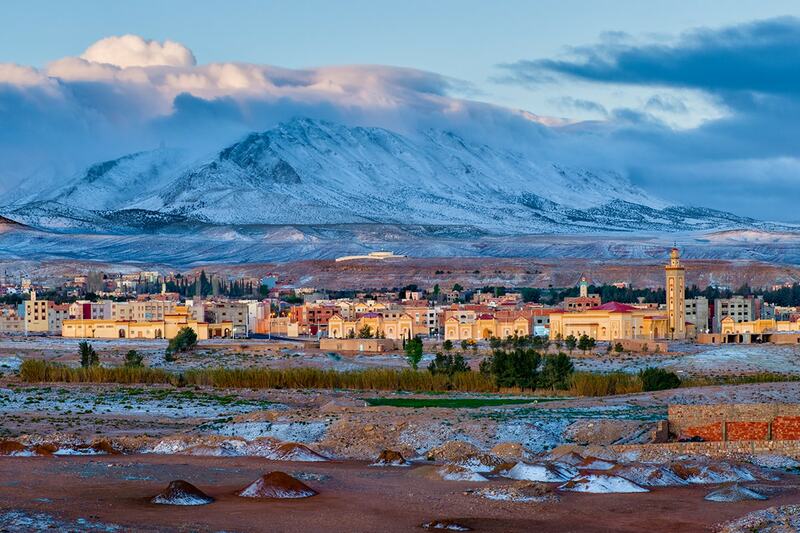 Midelt is a market town, originally built as a base for mining in the area, nestled in the high plains surrounding the Moulouya River between the Middle and High Atlas mountain ranges at an elevation of just over 1,500 meters. It is a perfect spot to break up the journey to the Sahara. After an optional lunch continue your journey to Merzouga (approximately 5 hours). 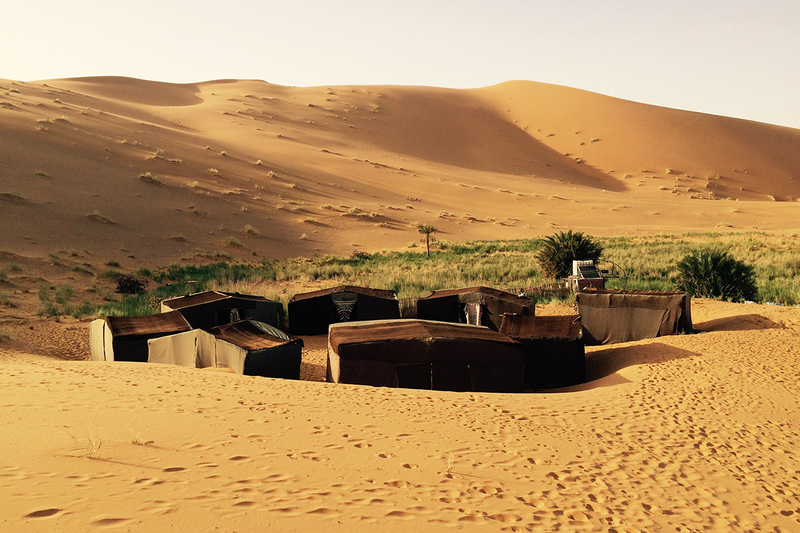 With a backdrop of the orange-colored Erg Chebbi sand dunes, the charming Saharan village of Merzouga feels wonderfully isolated, like the modern world has left it behind. 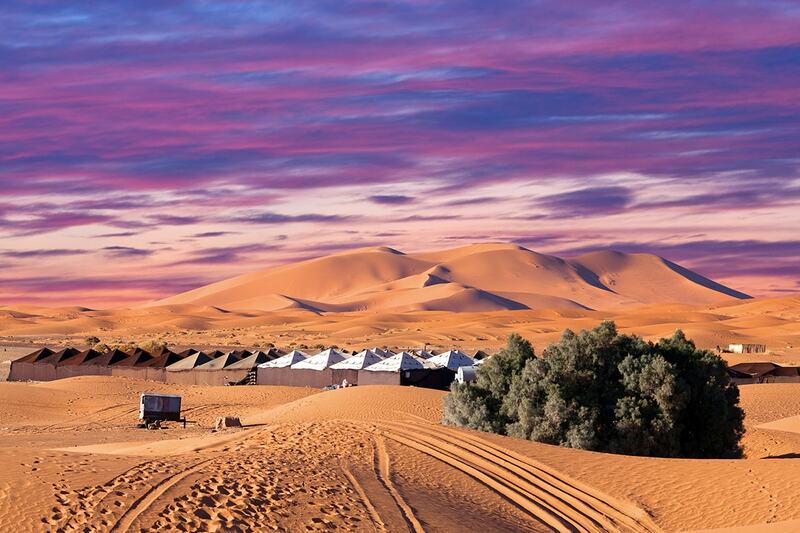 The Erg Chebbi dunes are the most stunning in the country and an essential part of any visit to Morocco. An erg is a vast sea of shifting wind-swept sand that’s formed into picturesque, undulating crests and valleys. The Erg Chebbi is one of the world’s iconic landscapes, with towering dunes up to 150 meters in height. Located at the end of a sealed road and just 20 kilometres from the Algerian border this really feels like frontier country. You will leave your gear at a simple auberge and then ride camels into the edge of the Sahara Desert, enjoying a spectacular sunset along the way. The dunes are stunning, especially as the evening light plays across them and sets off the colors. Tonight, you will camp out in traditional style, with the chance to try some fantastic local cuisine while you sit around an open fire, enjoying lively music and dancing under the stars. Enjoy a real Lawrence of Arabia moment this morning with a sunrise camel ride across the desert on the return journey to the auberge. Then drive to Todra Gorge (approximately 4 hours), a massive trench that rises over 250 meters to form one of the most dramatic and spectacular natural sights in Morocco. The limestone stacks make a perfect area for trekking, and so today you will take a short walk through the sheer cliffs. Leaving Todra Gorge today, set off on the fabled ‘Road of 1,000 Kasbahs’ to Ait Benhaddou (approximately 4 hours). Pause for lunch in Ouarzazate, where productions such as Lawrence of Arabia, The Sheltering Sky and Black Hawk Down were filmed. Time permitting, you can take a tour of the Atlas Movie Studios. 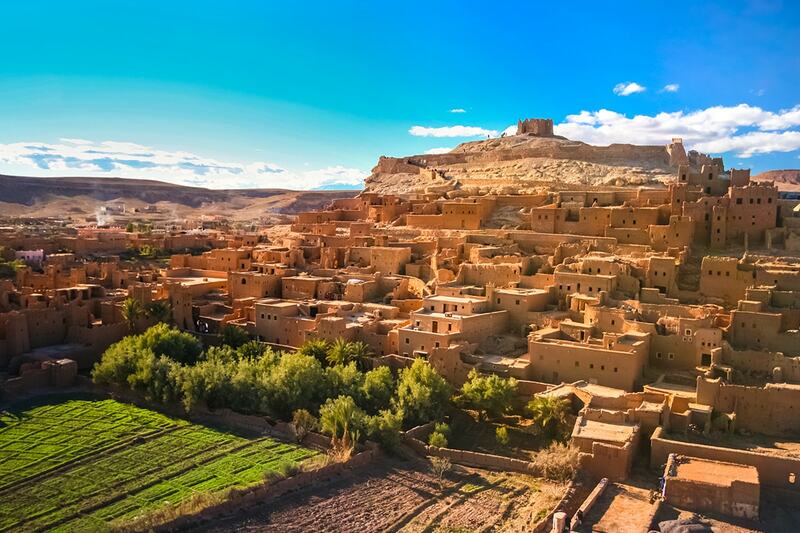 Perched on a hilltop and almost unchanged since the 11th century, Ait Benhaddou is one of Morocco’s most iconic sites. Its grant kasbah is one of the most beautiful in Morocco and the fortified village is a fine example of clay architecture. If you think you recognize the place, you probably do, as the town has a long list of film and TV credits, including Game of Thrones and Gladiator. 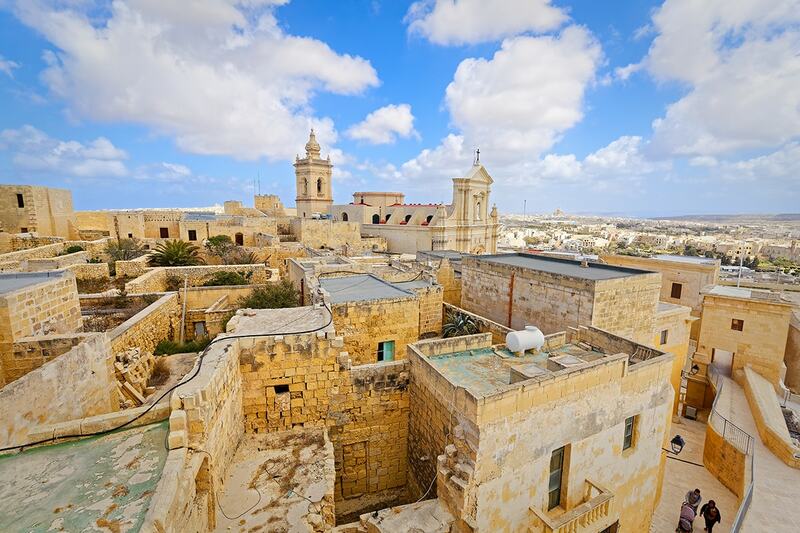 Enjoy a walk through the winding streets of the old town, making your way to the top of the hill, from where you can enjoy the views across the surrounding plains. After heading to your nearby hotel for the night, maybe sit back on the roof top terrace and watch the sun setting over the magical Kasbah. 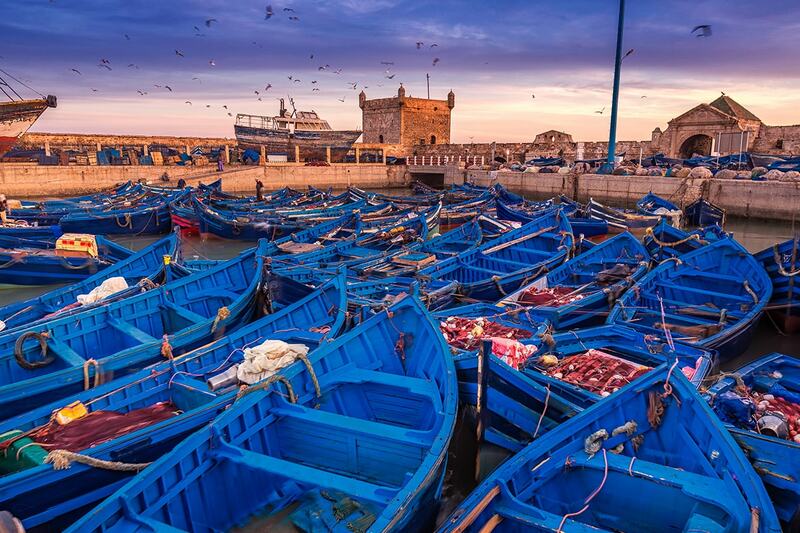 Today you will drive for several hours through the winding roads of the Atlas, towards the Atlantic Coast and the old fishing town of Essaouira, a city where the medina brushes up against the Atlantic Ocean. Sandstone walkways contrast with whitewashed houses, bright blue sky and the sand of the surrounding beaches and dunes. This artists’ town was once home to sizeable British and Jewish populations, and its charm has seduced people like Orson Welles and Jimi Hendrix, who (according to local legend) spent much of his time here in the 1960s. 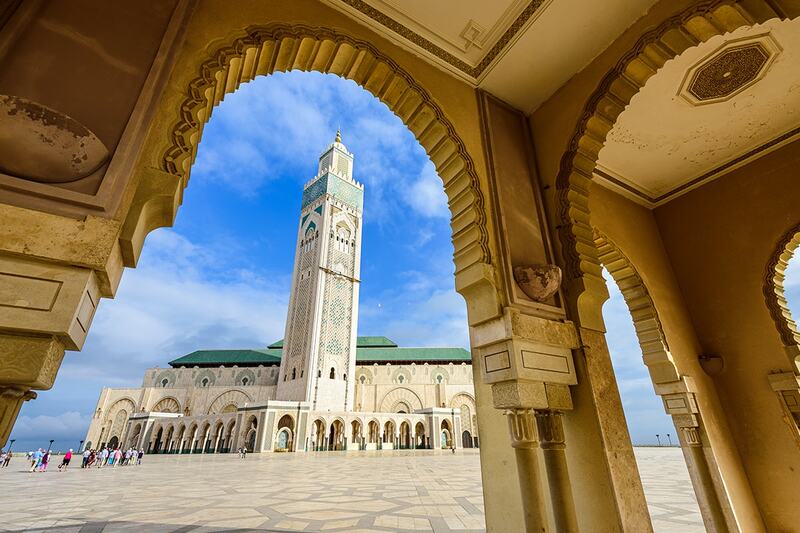 It is one of North Africa’s most attractive places, and you will soon find yourself slipping into the easy-going rhythm of this Moroccan town with a European seaside twist. Today is at your leisure. Indulge in the city’s many shops and restaurants and soak up the relaxing atmosphere. 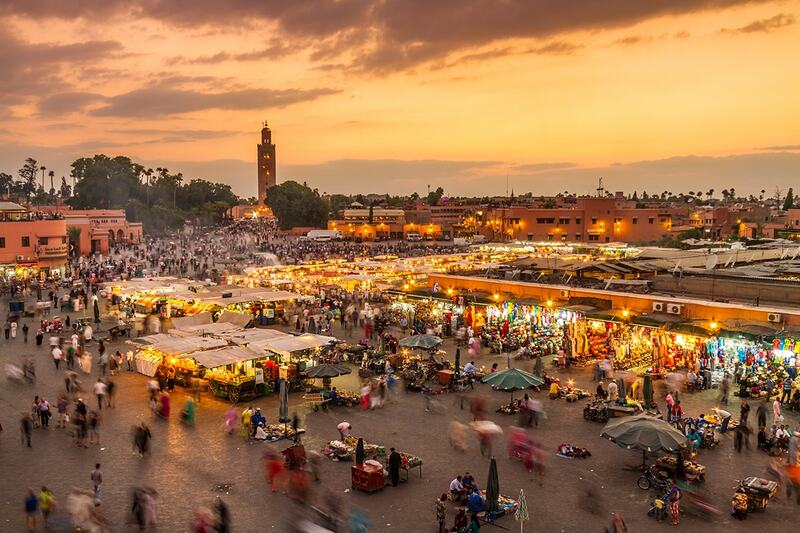 Travel to Marrakech this morning – an ancient, exotic city wrapped in European modernity. In the evening, join your local guide for an escorted foodie tour to discover the hidden local food shops in Marrakech. 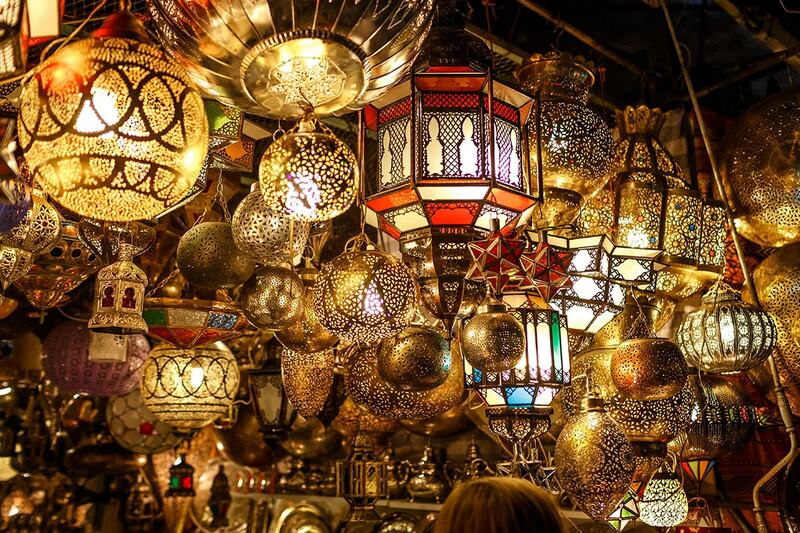 Visit the souks whilst sampling olives, dried fruits, seeds, pastries, and other Moroccan specialties. Visit a local spice market and hear how spices are used in Moroccan dishes before enjoying dinner in one of the many great restaurants lining the square. Today is at leisure. Feel free to head out to the markets and eternalise your stay with some unique souvenirs. After breakfast, you will be transferred back to Casablanca airport for your homeward flight. Please note: some flights may arrive home one day later. 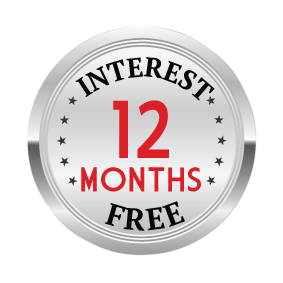 Single Supplement: $250 per person in addition to your twin share voucher. 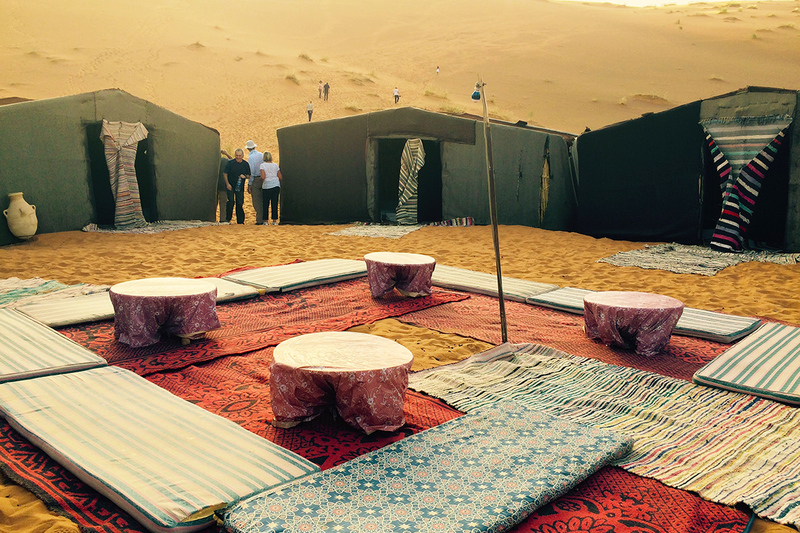 Please note – due to the nature of the experience, the single supplement does not apply to the desert camp. You will be sharing a room with other passengers. Children: Same price as adults. Min age 5 years. If you’re happy with the services provided a tip – though not compulsory – is appropriate. While it may not be customary to you, it’s of great significance to the people who will take care of you during your travels, inspires excellent service, and is an entrenched feature of the tourism industry across many destinations. The following amounts are based on local considerations and feedback from our past travellers: Restaurants: Local markets and basic restaurants – leave the loose change. More up-market restaurants we suggest 5% to 10% of your bill. Local guides: Throughout your trip you may at times have a local guide in addition to your leader. We suggest MAD20-30 (approx. AUD$3-$4) per person per day for local guides. Drivers: You may have a range of private drivers on your trip. Some may be with you for a short journey while others may be with you for several days. We would suggest a higher tip for those more involved with the group however MAD10 (approx. AUD$2) per person per day is generally appropriate. Over the years we have found that many of our travellers find the need for tipping to be both tiresome and embarrassing, especially if they don’t have the correct small change. To overcome this, we have established a tipping kitty system. At your group meeting, your tour leader may discuss the idea of running a group tipping kitty, whereby everybody contributes an equal amount and then your tour leader pays the tips while keeping a running record of all monies spent (except restaurant tips). The record can be checked at any time and any money remaining at the end of the tour returned to group members. Please don’t tip with coins, very small denomination notes, or dirty and ripped notes. This is regarded culturally as an insult. You may also consider tipping your tour leader for outstanding service throughout your trip. The amount is entirely a personal preference, however as a guideline $3-$6 per person, per day can be used. Of course you are free to tip more or less as you see fit, depending on your perception of service quality and the length of your trip. Remember, a tip is not compulsory and should only be given when you receive excellent service. * A $200 per person surcharge applies, please see the availability calendar for more details. Names cannot be changed once flights have been booked. Once we receive your booking form and your booking is confirmed, no further changes will be possible.